Ever since the negotiations to form a coalition government in Germany earlier this year, the Sozialistische Gleichheitspartei (SGP—Socialist Equality Party) has warned that the grand coalition government comprised of the Christian Democratic Union, Christian Social Union and Social Democratic Party is the product of a conspiracy to implement far-right policies in line with the programme of the fascistic Alternative for Germany (AfD). This right-wing conspiracy was revealed once again on Tuesday night. 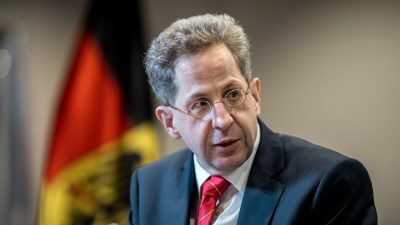 In recent weeks, Hans-Georg Maaßen, the head of the Federal Office for the Protection of the Constitution (BfV), the German secret service, has been increasingly exposed as a supporter and adviser to the AfD. It emerged that he consulted with the AfD before issuing the BfV’s annual security report. Then, following the neo-fascist riot last month in Chemnitz, in which ultra-right demonstrators were videotaped hunting down and attacking people they presumed to be immigrants, Maaßen publicly defended the rioters and cast doubt on the authenticity of the damning videos. This provoked mass protests demanding that Maaßen be forced to resign. Tens of thousands gathered in several cities to oppose the right-wing xenophobic agitation and the support given it by Maaßen and Interior Minister Horst Seehofer, the leader of the Christian Social Union (CSU). In Chemnitz, 70,000 people took part in a “rock against the right wing” concert. Under these conditions, the Social Democrats (SPD) declared that Maaßen was no longer acceptable as BfV president and demanded he be fired. However, Seehofer publicly backed Maaßen, declaring that his ministry was responsible for overseeing the secret service. The coalition committee met Tuesday evening under the auspices of the three party leaders and agreed that Maaßen would be replaced as BfV president. However, far from being dismissed, he would be given a position as state secretary in Seehofer’s Interior Ministry. Maaßen was not fired, he was given a promotion. He now holds a high position in the ministry that has powers of oversight and direction of the BfV. The coalition leaders declared that Maaßen would not be responsible for overseeing the BfV in his new post, but Seehofer made clear the worthlessness of this claim by stating repeatedly that he valued Maaßen’s work as a leading political official. The indications are that Maaßen will function as Seehofer’s right-hand man. He will receive a much higher salary as a state secretary than he did as head of the BfV. It remains unclear who will take over as head of the secret service. However, it is likely that a current state secretary in the Interior Ministry will move to the BfV to complete the musical chairs maneuver, removing the domestic intelligence service from the firing line and strengthening it. The German government has responded to the protests against the AfD and its neo-fascist provocations by shifting further to the right. The grand coalition is integrating the hated secret service president and his pro-AfD policy more directly into the government and attempting to cover up the right-wing conspiracy that has long been under way in the BfV by installing a new leadership. The SPD is playing a key role in this operation. With Maaßen’s promotion to state secretary, the SPD has demonstrated that its demand for his firing and its threat to withdraw from the coalition was pure theatre. The SPD is celebrating the elevation of Maaßen within the state apparatus as a victory. In reality, it wanted to avoid a new election at all costs. This was due not only to its fear of losing further support, but also because it did not want to hold an election in a situation where tens of thousands of people are taking to the streets each weekend to protest against the far-right and a powerful mass opposition to the grand coalition’s right-wing policies is developing. It was not for nothing that the SPD negotiated for months behind closed doors to bring about the coalition, thereby making the AfD the official opposition in parliament and granting it political legitimacy and greater prominence. In almost all areas, the new government’s policies conform to the AfD’s right-wing extremist politics. The coalition agreed on the doubling of the defence budget to make it the largest military budget since World War II. Seehofer’s “masterplan,” adopted by the grand coalition, included a major expansion of deportation and internment camps for refugees. At the same time, the police state infrastructure is being strengthened. The AfD has been fully integrated into parliamentary work by the SPD, in particular. As the new parliament was being constituted, the SPD demanded a “collegial” approach to the AfD. Stefan Brandner, a leading AfD politician, has the SPD to thank for his appointment as chairman of the parliamentary judicial committee. It was Thomas Oppermann, the SPD vice president of parliament, who proposed Brandner, a representative of the volkish-nationalist wing of the AfD and close ally of the right-wing extremist Björn Höcke. The connection between the government and the AfD was clearest of all in the secret service. Maaßen met with leading AfD politicians on numerous occasions and discussed his agency’s plans with them, even though these plans were considered state secrets. Brandner has confirmed that Maaßen spoke with him about this year’s secret service report. Neither the AfD, nor its neo-fascist wing, nor numerous other right-wing extremist groups are mentioned in the report. Instead, organizations that oppose the right-wing extremists are labeled “left-wing extremists.” For the first time, the SGP is declared to be “left-wing extremist” because of its opposition to capitalism and nationalism, according to the report. Maaßen used the secret service to politically strengthen the AfD and the most right-wing circles in Germany. He is now being rewarded accordingly. He took over as head of the BfV in the summer of 2012, when the intelligence agency was in deep crisis. Nine months earlier, news about the right-wing terrorist cell National Socialist Underground came to light. Many agents of the secret service were active in its milieu. The BfV subsequently shredded a large number of files. Heinz Fromm, Maaßen’s predecessor, was forced out as a result of the scandal. Maaßen did not put a halt to ties with far-right extremist groups, but strengthened them. In early 2015, he filed criminal charges against two journalists from the blog Netzpolitik.org. He thus initiated a clampdown on freedom of speech while at the same time establishing close ties with the AfD. It became clear this summer that the BfV was much more involved in the terrorist attack in Berlin in December 2016 than had previously been known. There is much to suggest that the attack was aimed at creating an atmosphere of fear at the beginning of an election year, so as to strengthen the AfD. With its decision to promote Maaßen, the grand coalition is giving its backing to the right-wing networks in the secret service and leaving no doubt about the character of the current government. The SGP therefore demands the dissolution of the BfV and the immediate holding of new elections. The vast majority of the population opposes the government’s right-wing policies, which were negotiated behind closed doors by the losers of last year’s election. The SGP is doing everything in its power to mobilise the only social force capable of halting the right-wing, authoritarian and militarist policies of the ruling class and all of its parties—the international working class. This requires a socialist perspective. Stop the conspiracy of the grand coalition, the state apparatus and right-wing extremists! No more war! Stop Germany’s return to a militarist great power policy! Dissolve the secret service! An immediate halt to the surveillance of the SGP and other left-wing organizations! Defend the right to asylum! No to the militarisation of the state! No to surveillance! End poverty and exploitation—for social equality! Expropriate the super-wealthy and place the banks and corporations under public ownership and democratic control!